when aspidos and i were engaged, we would meet up on weekends to buy stuff for our hantaran or to hang out. of course it wasn't a weekly thing. once a month ke, or something like that la. then, when we got married, we would go to weddings or dating at the mall (tak romantic langsung) on weekends. now, we that we have nadrah, our weekends consist mostly of shopping for baby stuff and groceries. there were times yang kitorang kelam kabut nak beli barang sebab nadrah dah start menangis. 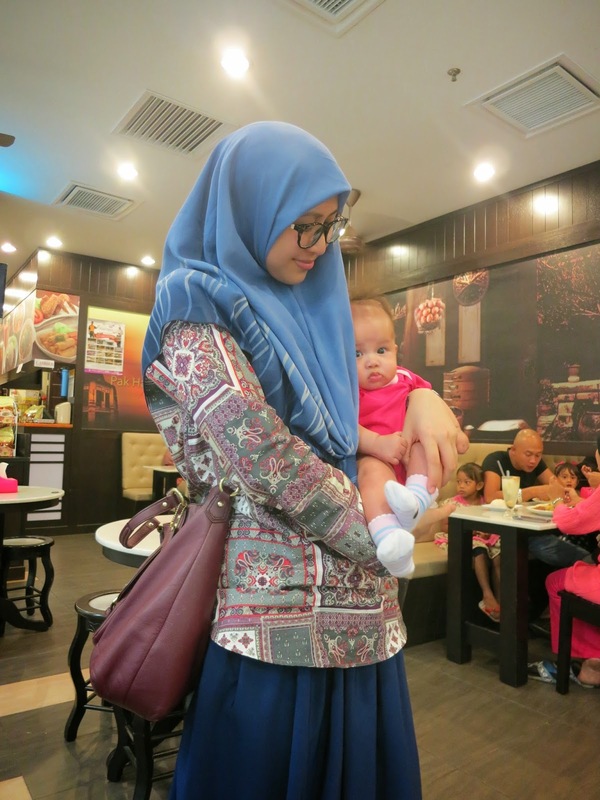 either nak susu, nak tukar pampers or rimas duduk dalam stroller. alololo muka blur blur baru bangun tido! meh kish sket! and as much as we didn't like it, we just had to. it's kinda hard to do heavy duty shopping because the stroller takes up boot space. i know, i know.. nadrah and i should stay at home while hubs do all the grocery shopping. tapi... itu je la kita punya 'outing'. wuwuwuwuuu..
but now we can just buy our groceries and necessities on tesco online je. did you know? if you don't, meh i tolong. i think it's very convenient for us all, a housewife, a working woman, or a husband, to buy our stuff online, and use that time to do some family bonding or rest. just go to eshop.tesco.com.my and register. that's it! you'll find that it's easy to navigate and purchase your things coz it's all organised well on the website. ok sorry tak nampak sangat. but you get the gist! under "Chilled & Frozen" contohnya, got loads of categories we can choose from. 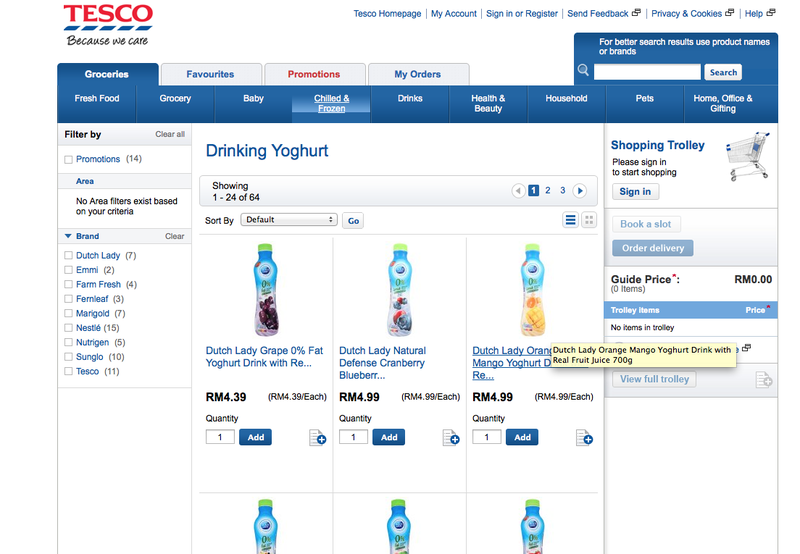 and then contohnya i nak "Drinking Yoghurt"
if you're an online shopper, this is easy peachy too. oh, you make payment when the van arrives ye sebab sometimes ada some items yang habis stock or they changed it with different brand because dah habis. you have the option of accepting or rejecting them, so no worries! toksah penat penat cari parking. toksah penat penat angkat barang masuk kete, keluar kete. toksah penat penat pusing sana sini cari barang. then boleh la spend time betul betul as a family kat kidzania ke apa kannnnn! hehehe! i like to shop at tesco whenever i'm back in shah alam (hometown). but now i'm staying in putrajaya and there's no tesco here. i hope they can deliver the items in putrajaya area :) thanks for sharing! Yup. 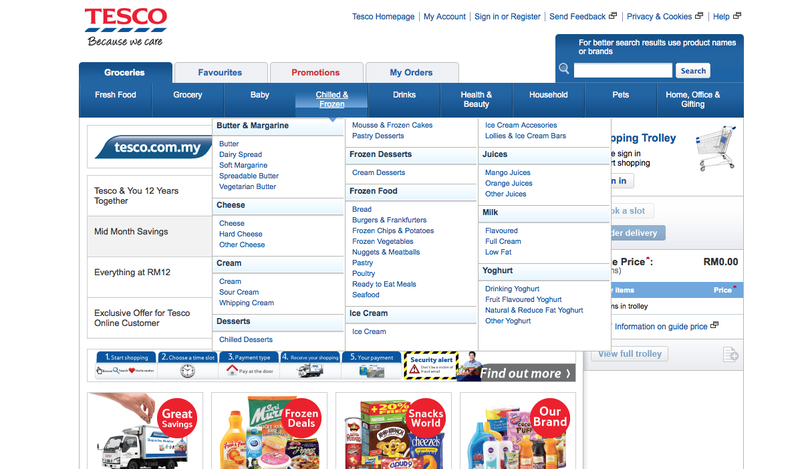 Tahu tentang tesco online shopping ni. Tapi belum pernah cuba lagi. One day maybe. Woah, izi~brizi. 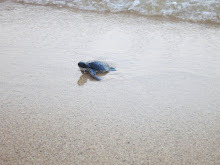 kena kenalkan kat family ni, save duit minyak :) thanks kak Mar. Gambar pertama Nadrah marah. Haha. Cute. x tahu plak ada...ada limid min or mix..kak..? there is 1 fb user using nadrah pic in the stroler n claimed that nadrah is her daughter. with a caption "ank dara kesayangan mumy kcik2 dlu.cptnye ms berlalu.dah besa rupenye."